This motif was fun and easy to do up! I used 3 different size acrylic circles. I then used the seams as my reference points. 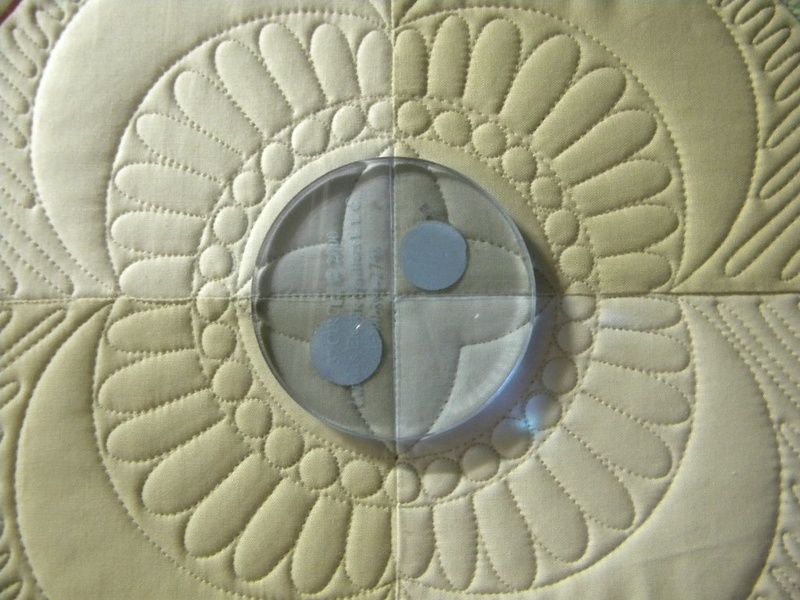 Using the larger circle, I sat the edges on both seams and starting on the left seam, stitched half way around the circle to the top seam (sample above). With needle down I then re-positioned the circle and repeated the same thing until I came back around to where I started. 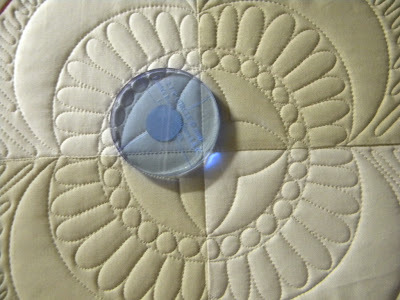 With needle down I then positioned the circle a quarter inch in from the stitch points on the seam (sample above). Repeat this also going all the way around until you come to where you started. That creates your outer flower petals. Using the same circle, stitch a circle in the center. With need down, continue with your outside filler ( my filler is the up/down bumps) feather would be pretty too. Using the medium circle, stitch a circle with in the other circle. Needle down do a pebble filler. Next, with needle down make the center motif using the smallest circle. Starting at the top, stitch down and eyeball the center point....move the circle and stitch the right side...repeat all the way around to the beginning. I then did a filler on the very outside of the motif...to help it really pop out.